Various artists use technical mastery to create visions of impending doom. If art is supposed to mirror the spirit of its times, then some new shows in local galleries reflect an era of degradation that should give us pause. The good news: These artists tackle their subjects with impressive technical prowess and invention. The Olympic Peninsula artist is best known for her cameo engraved glass works, which translate photographic images into ghostly affairs. 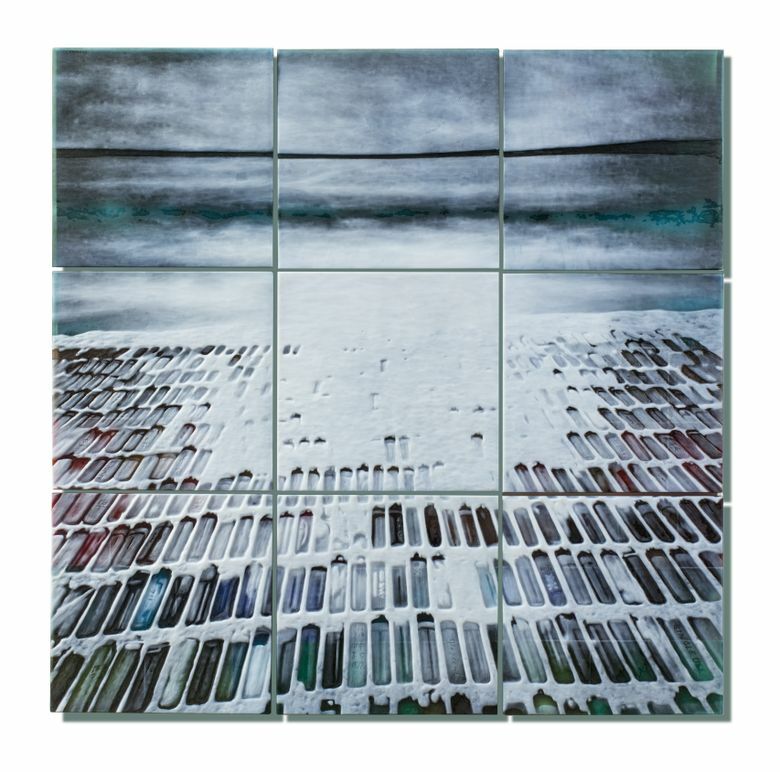 “I use flat glass that is comprised of colored layers,” Surgent says on her website. “A panel of glass is to me what a blank canvas is to a painter.” The engraving process brings out blue and creamy tones in the glass that suggest bleary film images. Her new show at Traver Gallery also features ambitious installations that are as worrisome in meaning as they are visually beguiling. From a distance, it resembles a stained-glass window. Up close, you can see it consists of thousands of cigarette lighters hanging from a metal framework. Surgent scavenged them from beaches in the Northwestern Hawaiian Islands during a gig there as an artist-in-residence with the National Oceanic and Atmospheric Administration’s Hawaiian Monk Seal Research Program, which inspired both her images on glass and installations. Like “All the Little Things,” the cameo engraved glassworks please the eye while sounding alarm bells. Their titles alone — “The Unnatural Movement of the Ocean with Plastic,” “The Astonishing Afterlife of Our Disposable Objects” — indicate their concern with environmental degradation. While at Traver, don’t miss five stunning new pieces by ceramic artist Tip Toland, who takes a weird glee in states of human decay. “Beauty Parlor,” with its cheery female figure hoping to mask time’s ravages with a whimsical new hairdo, is classic Toland. 10 a.m.-6 p.m. Tuesdays-Fridays, 10 a.m.-5 p.m. Saturdays, through Oct. 28. Traver Gallery, 110 Union St., #200, Seattle (206-587-6501 or travergallery.com). 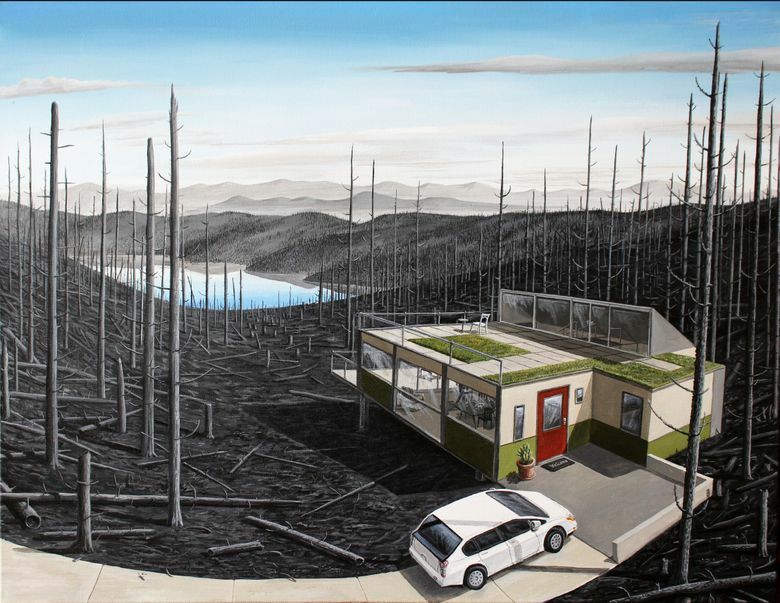 These two wittily paired shows by Seattle painters pit humanity’s threats to nature against nature’s threats to humanity. Dunkerley’s acrylic paintings, evoking end-times scenarios, are as jaunty as children’s books illustrations. In “Apocalypse Modern,” a lovely glass-walled home with an appealing lake view sits amid charred forest remains that stretch to the horizon. “Location Location Location” depicts a Miami-like city succumbing to rising tides, while “Seller’s Market” shows rising condos under construction on a melting iceberg. 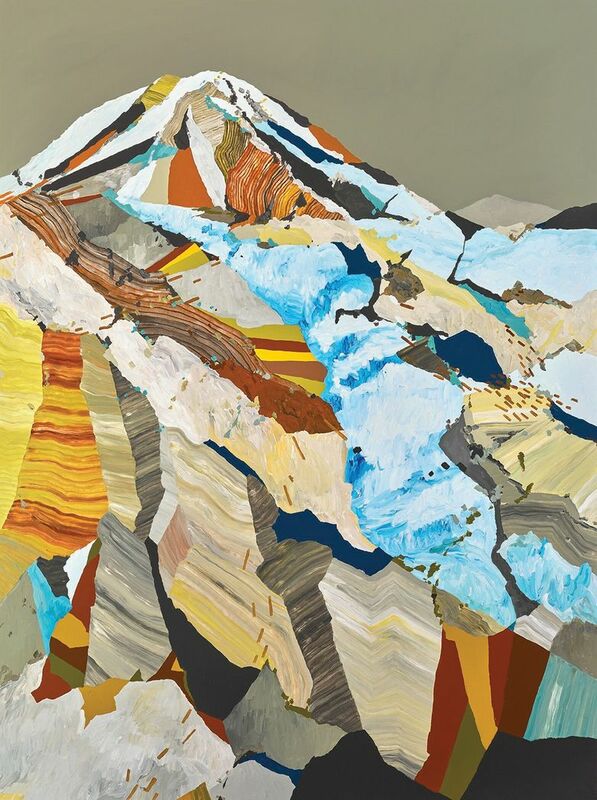 Molenkamp’s volcano-obsessed new paintings envision disasters of a different sort. The four huge panels of “Vancouver! Vancouver! This is it!” re-imagine the 1980 eruption of Mount St. Helens in comic-strip fashion. His “Fear of Volcanoes” series evokes exploding-magma nightmares. The work is technically fascinating in two ways. The geological strata of Molenkamp’s volcanoes, rather than being hidden away, are out in plain view. And his contrasting arrays of acrylic hues give his rugged peaks a crazy-quilt quality, in which heightened artifice equals heightened apprehension. 10:30 a.m.-5 p.m. Tuesdays-Saturdays through Oct. 28. Linda Hodges Gallery, 316 First Ave. S., Seattle (206-624-3034 or lindahodgesgallery.com). Denver artist Huckins could find steady work as a forger if he chose to do so. Instead, he uses his talents to highlight the ways our public discourse has become debased in the Twitter era. His acrylics-on-canvas impeccably re-create paintings of prominent Americans by Gilbert Stuart, John Singleton Copley and other American artists of the 18th and 19th centuries. 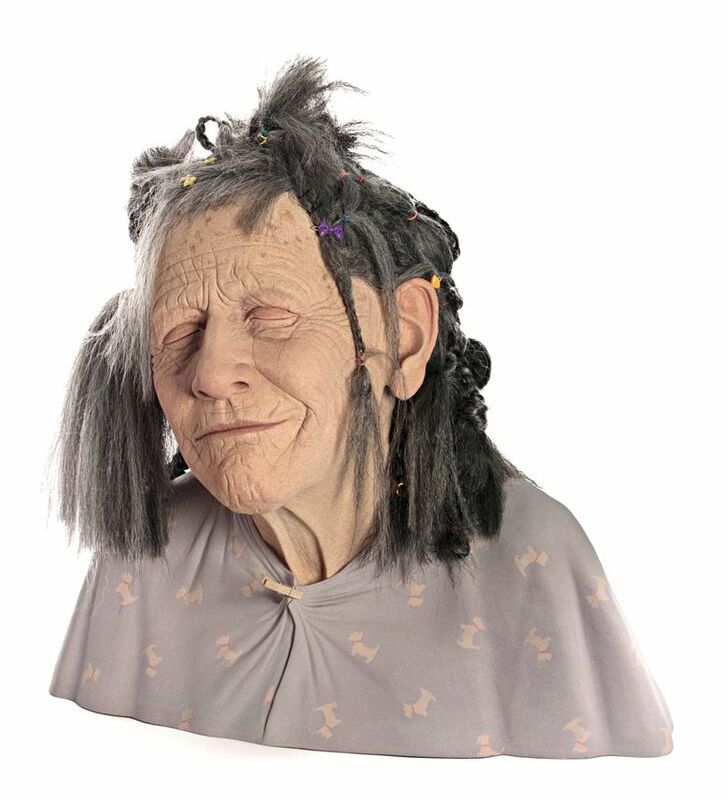 The twist: Huckins defaces these replicas with cyber-slang text and smartphone icons, painted as neatly as the portraits themselves. 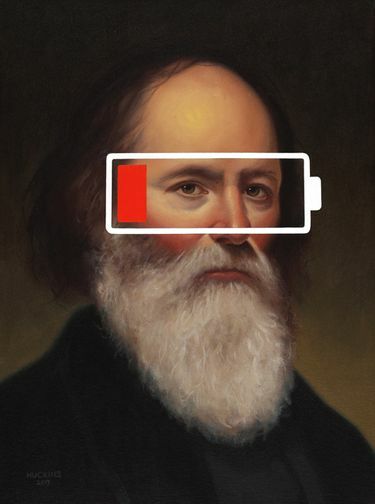 In “Charles Loring Elliott: Panic One (Low Battery),” the eyes in a 19th-century self-portrait are framed by the dreaded sight of a narrow red bar indicating a cellphone almost out of juice. In the show’s title painting, a 1796 Stuart portrait of George Washington is overlaid with the words “I CNT PRTEND DAT THIS IZ POETRY.” A sublime Albert Bierstadt Rocky Mountains landscape has “ctrl alt del” brandished across it, as if it is about to be banished by a keyboard command. Huckins’ exquisitely precise satirical vandalism shows us how far we’ve fallen. 10 a.m.-6 p.m. Tuesdays-Saturdays through Oct. 21. Foster/White Gallery, 220 Third Ave. S., Seattle (206-622-2833 or fosterwhite.com). Faigin, artistic director of Seattle’s Gage Academy of Art and a regular contributor to The Seattle Times, isn’t quite the technical perfectionist that Huckins is, but he gets his points across. His sardonically titled “A Balanced Diet,” for instance, depicts a meal of dubious nutritional value precariously situated on industrial scaffolding that extends as far as the eye can see. 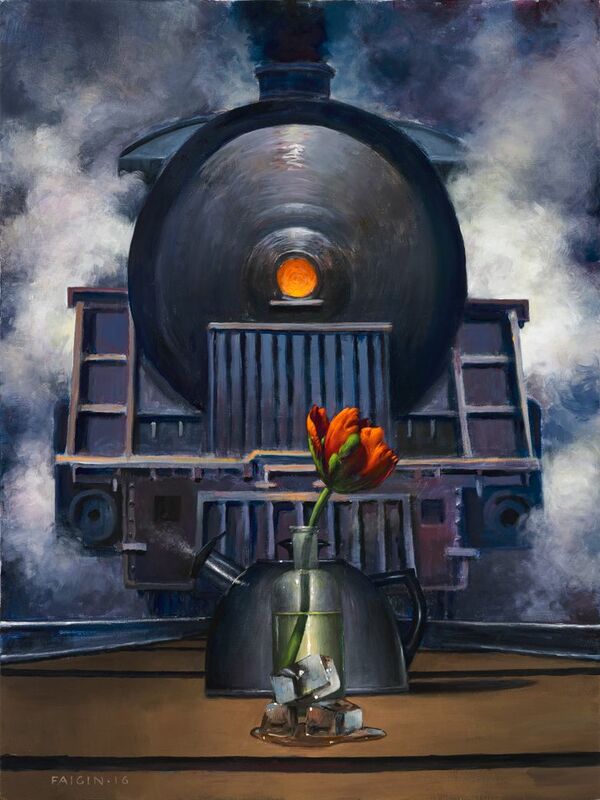 “The Water Cycle,” the most striking of several train paintings, juxtaposes melting ice cubes, a tulip in a vase, a steam kettle and a railroad engine to demonstrate a slightly dubious organic-industrial H2O-fueled circle of life. This is quirky, eye-catching work. Noon-5 p.m. Wednesdays-Saturdays through Dec. 2. Bonfire, 603 S. Main St., Seattle (206-790-1073 or thisisbonfire.com).